OMG!! Now that we've all had the chance to somewhat 'recover' from the massive political shock of watching career politican Charles Djou fold like a cheap lawnchair and openly transform into a pro-rail, pro-taxes Democrat right before our eyes, Hawaii Republicans need to urgently review this humiliating spectacle and take stock of what happened and (more importantly) what SHOULD have happened and (most importantly) answer the question "Where do we go from here as a party?" 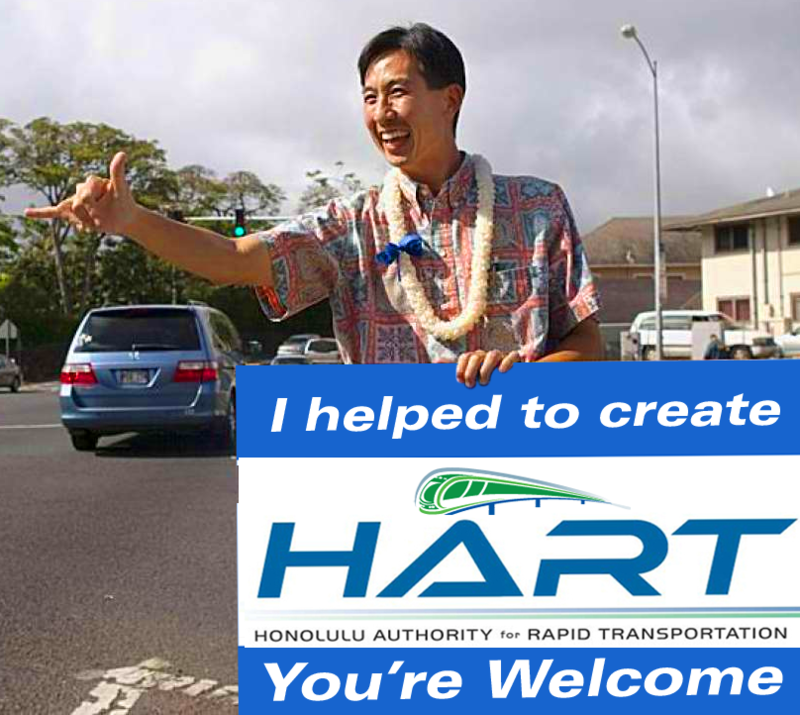 By now, you know that RINO and former City Councilman Charles Djou ( the founder of the multi-billion dollar HART agency and the official issuer of HART's blank check for 34-miles of heavy rail, in case you forgot ) has waved the white flag of surrender by fully embracing Caldwell's pro-rail, pro-tax positions right after the Obama administration's Federal Transit Administration (FTA) joined with with Hawaii Democrats to announce that: The Federal Government will not be happy unless the already swindled taxpayers of Oahu are forced to continue paying the ever-increasing pricetag for the Rail Cartel's deliberately under-estimated get-rich-quick scheme known as the rail project . 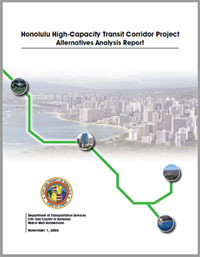 In other words, in order to keep soon-to-be-former President Obama and his soon-to-be-unemployed 'smart growth' rail pushers at the FTA happy, then Caldwell, Djou, the City Council, the State Legislature and Governor Ige must overtax Oahu residents in perpetuity so that Democrats, unions and the construction industry, and real estate developers get their train, their stations, and their transit oriented development sweetheart zoning around every train station . . . plus generous kickbacks for all the 'smart growth' politicians who cooperate with the Rail Cartel's agenda. 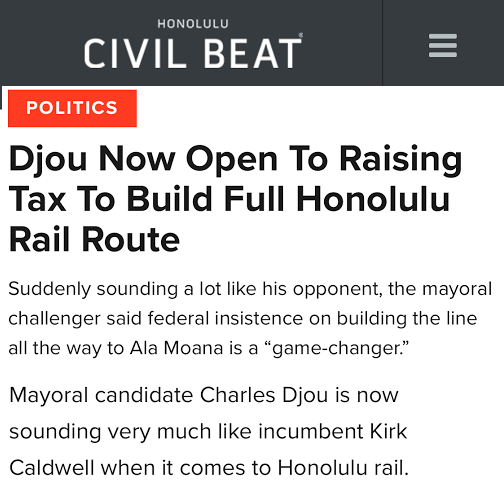 And Charles Djou has proven to be a BIG supporter of "Transit Oriented Development" or TOD -- that's where the BIG money is. Check his voting record. Well, take it from HIRA: Surrendering to Obama's FTA without any kind of a fight is unacceptable!! Look, Obama will soon be gone from office. 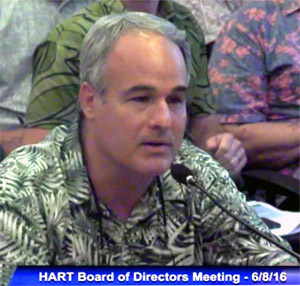 And the FTA was a knowing participant which actively conspired with the City administration to scam Oahu taxpayers. The Obama administration got in bed with the corrupt Mufi Hannemann, Peter Carlisle and Kirk Caldwell administrations to perpetrate this heavy rail transit fraud against taxpayers which gets worse and worse with each new revelation. The FTA's contract to use taxpayer funds to subsidize this taxpayer-funded project was based on a bait and switch defrauding of taxpayers. WE DO HAVE A CHOICE. Honolulu's next mayor shouldn't be wasting time trying to justify the rail project or 'make it work' or 'manage it better' or even 'find the money' to pay for it. The next mayor needs to order the City's attorneys to file a class action lawsuit on behalf of taxpayers against the FTA for its role in scamming Oahu taxpayers. If and when we cancel the rail project, we shouldn't owe a penny to the Obama administration. We can easily prove that taxpayers were fleeced by the Obama administration, the local Rail Cartel and puppets Mufi Hannemann, Peter Carlisle and Kirk Caldwell whose systematic campaign of disinformation repeatedly told lies to desperate Oahu commuters about traffic congestion relief and costs and more during the leadup to the 2008 election when rail was on the ballot. Yes, Obama's FTA knows we were lied to and they looked the other way because Democrats currently running the FTA are pro-rail. But, frankly, any class action lawsuit by the City against the FTA to stop rail (and not have to pay back the FTA) is a pipedream because we don't have a real Republican running for mayor of Honolulu. RINO Djou's tough guy stance collapsed right before our eyes. While entirely predictable to those who know Djou's liberal voting record, it was still very painful to watch. 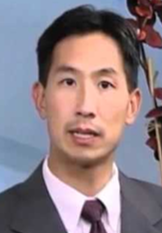 Then, as if to make the tragic situation more comical, RINO Djou tried to juggle several rhetorical balls in the air simultaneously: (1) "I am open to increasing taxes"; (2) "I will definitely veto a tax increase (even though it only takes six votes on the city council to override my veto)"; and (3) "my hands are tied, we may have to increase taxes". That's not the talk of someone who has the stomach to face off with Obama's minions at the FTA and tell them to kiss the okoles of Oahu taxpayers. Frankly, with only a month and a half till Election Day, it's too late to save RINO Djou's flailing campaign for mayor. Voters know a false choice when they see one. 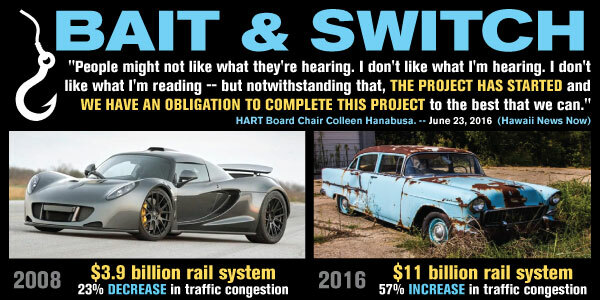 To be clear, HIRA opposes the Caldwell-Djou Bailout of the rail scam as well as the underlying scam itself. A core Republican value is to vigorously oppose squeezing taxpayers for big government make-work projects which enrich special interests and provide virtually no benefit to the public at large. On the other hand, a fake Republican value would be to respond to the FTA by pretending that our hands are tied: " We have to do rail, we have to take it to Ala Moana," Djou said . "It has to be elevated, and it has to be heavy rail, period ," as Djou told Star-Advertiser recently. 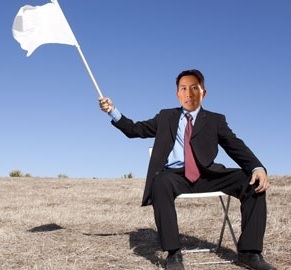 That's the unmistakable white flag of surrender being waved by Hawaii's top "Republican" (not to mention the total silence coming from useless GOP leaders at Hawaii Republican Party headquarters). Additional fake Republican responses from Djou in recent days include Djou telling Hawaii News Now that we 'don't have a choice': " The FTA is not leaving our community with any other choices or alternatives. " Or Djou telling the Star-Advertiser that " we need new management " of rail (even though he is the one who proposed the current law of putting HART in charge of rail, rather tha n the mayor and his transportation director). Or Djou telling the Star-Advertiser that "he is now willing to consider asking the state Legislature for an extension of Oahu's 0.5 percent surcharge on the general excise tax ." All total RINO poppycock which serves to provide Democrats with official cover from the Hawaii GOP to continue fleecing taxpayers and continue diverting funds to the Rail Cartel. DJOU KNEW WE WERE CONNED: Voters were lied to by our own city and state governments in order to enrich the Rail Cartel. But instead of showing some backbone, Djou has chosen to ignore all these lies to voters by acting like building rail is his 'sacred duty'. Here's what he told KHON when he announced his candidacy for mayor: " I respected the decision made by voters in 2008 in favor of rail and shifted my focus from trying to end the project to trying to improve it ." Djou cops out in his own campaign e-mails, saying: " the people voted in favor of rail and I respect that vote ." 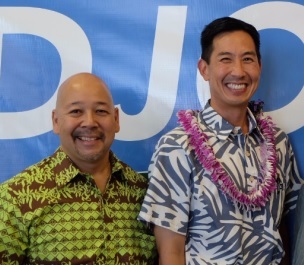 And Djou's campaign website talks about Djou's desire to "honor the commitment made to the people". Those are the words of someone who does not mind the public being ripped off. NO, CHARLES, THERE'S NOTHING ' SACRED' ABOUT RAIL: Actually, the commitment sought by "the people" in 2008 was to reduce traffic congestion. "The people" didn't and still don't want a "mas s transit solution". All the polls taken in 2008 show that what we wanted in exchange for paying $3.9 billion in higher taxes is what we were explicitly promised: reduced traffic congestion. That's right. And even though only 5% of Oahu commuters ride TheBus, a slight majority of 50.6% of voters in 2008 voted to spend $3.9 billion for promised traffic relief on H-1 because they were told that rail would REDUCE traffic congestion by 23%. Unfortunately, fraud prevailed in 2008. 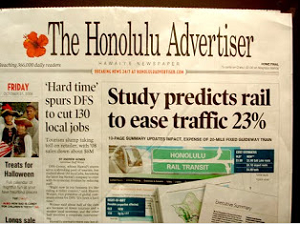 Thanks to taxpayer-funded advertising from the Mufi Hannemann administration and other deceitful public relations shibai which promised a decrease in congestion if we were to build rail, little did voters know in 2008 that traffic would actually get worse by 57% according to the City's own 2006 study concerning the bogus impact of rail on Honolulu congestion. 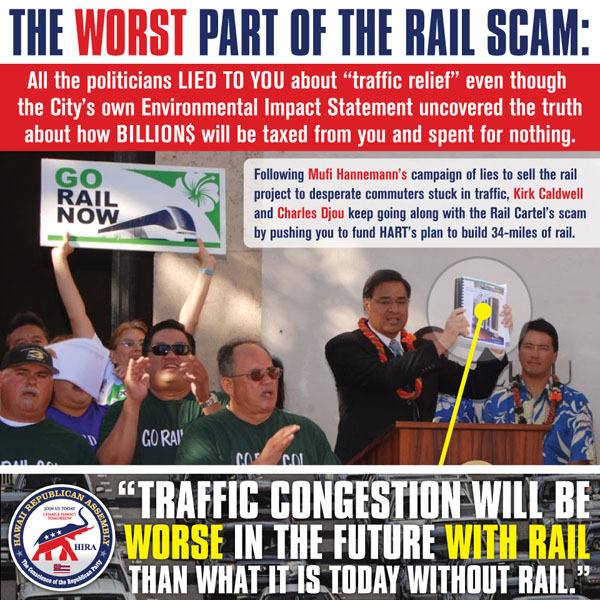 Yes, the public was LIED TO about the costs and benefits of rail so many times before that 'sacred' 2008 vote that it sickens us to see Djou pretend that these lies weren't told and watch Djou justify the 34-mile rail project as a "promise to the people which must be kept". What utter shibai!! Despite knowing that we were conned, all that Djou has to say on his website is " At this point, we can't stop the rail project . " That would be like having the police department tell you that since the bank robber has already driven his getaway car to the other side of town, there's no point in giving chase: "Just let the robber keep the money so we can get back to eating donuts instead." Yes, 2016 has seen a banner year of 'anti-establishment' sentiment among the voters, even here in Hawaii . The issues from A to Z are all on the side of the incredibly silent and relentlessly ineffective Hawaii GOP. So it's a shame that on the biggest issue facing the City, after being handed t he issue of a lifetime on a silver platter, Djou chose to embrace the political establishment Democrat Rail Cartel's position instead of taking the winning conservative stand. 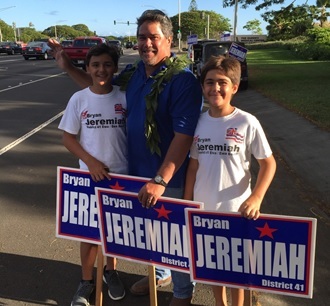 With Djou becoming a "me too" clone of Caldwell on the #1 issue in the race, this election for mayor is now over. However, instead of mocking conservative values and the Republican brand, Caldwell-wannabe Djou could decide to wake up tomorrow and actually fight for Republican values. If he were to adopt a new platform to eliminate HART, stop rail, repeal the rail tax, and actually fix traffic congestion, then Djou would deserve another look. But now he's the same tax-n-spend progressive as Caldwell; trying to outbid the Democrat to get elected. At this point, voters aren't being presented with a real choice. It's now clear that the fight to protect taxpayers will no longer be fought or decided in this year's election for mayor . 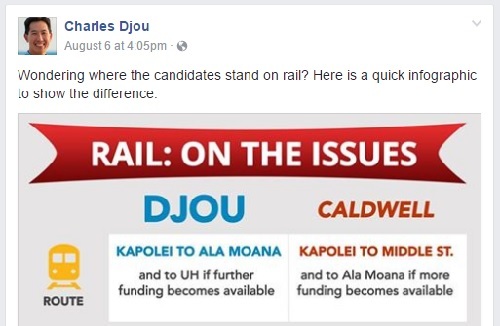 Once the current nonsense, false choice campaign between these two big government liberals is over on November 8th, taxpayers will need real leadership in the battle against the punishingly high taxes and wasteful spending which both Djou and Caldwell support in order to realize their shared goal of blowing a fortune on 34-miles of heavy rail. So what should Republicans do next? 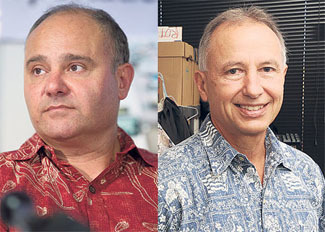 Take it from Panos Prevedouros and Randall Roth (author of "Broken Trust" and "Price of Paradise") whose powerful op-ed in the Star-Advertiser a few days ago argued that "It's not too late to make right call on rail: pulling the plug on rail now." Yes, PULL THE PLUG ON RAIL NOW. But who will pull the plug? Politicians? Nope. HART? Nope. The Democrat-controlled state legislature (with 4 out of 7 Republicans supporting tax hikes for rail)? Nope . The Democrat governor? Nope . The only people left who could pull the plug on rail are voters . Which brings HIRA to the good news in 2016 . . .
On the bright side, there are two promising developments which can help taxpayers. 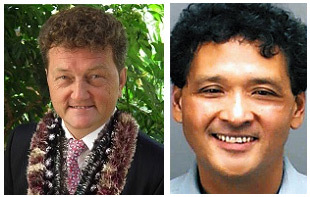 First, the pro-taxpayer, pro-commuter candidate Emil Svrcina (who happens to be Vice President of HIRA) is running for the Honolulu City Council to unseat liberal Democrat Ron Menor, a compliant puppet of the Rail Cartel and the government employee unions. Emil Svrcina (pronounced 'schvorcheena') is a courageous conservative who will not buckle under pressure from Obama's FTA, the Rail Cartel, the Democrat Machine, or any liberal special interest groups. [ stay tuned for detailed info this week from HIRA about Emil's candidacy ]. The second bit of good news is that Emil Svrcina is leading an effort to put rail back on the ballot so that Oahu taxpayers can cast votes knowing far more than we were told in 2008; when we were inundated with lies about low costs, traffic relief, huge ridership, speedy construction, and low operating subsidies. Now that we know the truth, we ought to have the right to vote again. Democrats don't support a re-vote. The Rail Cartel also opposes a re-vote. And Hawaii's GOP leaders have kept their distrance. But there is a way! HERE'S A HINT: It turns out that voters have the right to shorten the 34-mile rail route approved by the council in a city ordinance back in 2006. Yes, with enough signatures, we can put rail back on the ballot and put a stop to the waste, the fraud, and the abuse of taxpayers by the Democrats, Obama's FTA, Djou's HART agency and the Rail Cartel. Visit HIRA Action's "Make Rail Affordable" website for more info. Finally, mahalo for your attention to these critical issues which will affect all of us for generations to come. Your feedback is always welcomed by HIRA and you are invited to e-mail us at info@hawaiirepublicanassembly.com. Thanks again! Kapolei, entrance to Honokai Hale off Farrington Hwy.